“As we are faced with darkness there is hope. Today a special report from the Inter-governmental Panel on Climate Change (IPCC) on the impacts of global warming of 1.5 degrees Celsius was released. The messages within the report will generate both hope and fear, yet are abundantly clear in terms of the need for action. The report is all about the Pacific - anything above 1.5˚C threatens the very fabric of our communities and islands - and not just about the Pacific – climate change is a threat that no nation, however wealthy, can afford to ignore. A 1.5˚C world will bring huge challenges to the Pacific, our people and our ecosystems. Yet compared to 2˚C and above it is a world of possibility and hope. By keeping temperatures below 1.5˚C, climate-related risks to health, livelihoods, food security, water supply, human security, and economic growth will be reduced. There will a future for at least some of the coral reefs so intrinsic to our Pacific identities and economies. 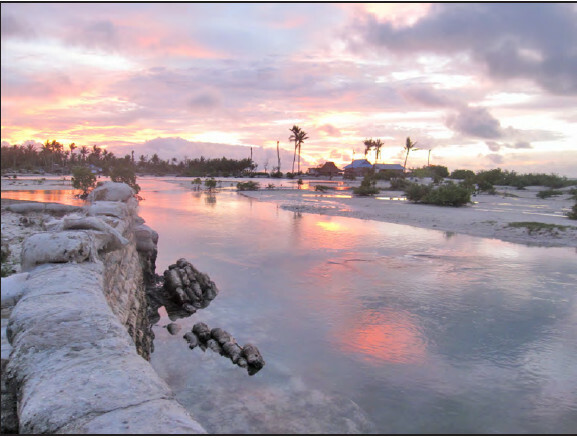 Atoll communities will suffer as sea levels rise, but there will be hope that the ocean will stabilise. Adaptation limits may be reached in some places, but enhancing resilience will bring possibilities for an improved future for many, including moving us closer to achieving our Sustainable Development Goals. Let us not dwell on 2˚C and above – for Pacific Islanders it is simply not an option. This report gives us hope – it is clear that it is possible to keep global warming to 1.5 ̊C and that we now have the specific information we need to be able to make this happen. Humanity has the power to make the changes needed. This report is our guiding document, it shows our current state, where we would like to be and what it is that we need to do to get there. While our Pacific islands are small and face many challenges, we are strong in unity. We are strong when we work together with all Small Islands Developing States. This was demonstrated loud and clear when we worked together to negotiate for the Paris Agreement to include text for Parties to pursue efforts to limit the temperature increased even further to 1.5 degrees Celsius. We, a group of Small Islands Developing States, mobilised in Paris, 2015 to have the global community agree to this. And we were right to do so, this report tells us so. According to the IPCC, over 6,000 research papers were assessed, 42,000 comments were received in the three reviews resulting in a report that had 91 authors and editors of whom 32% were women and 68% were men from across 40 countries. We are beyond disputing or questioning the report and the science from the IPCC. We now need to question ourselves. This report is the impetus, it’s the wakeup call for Governments, it gives us all a road map for our future. We no longer have time for complacency or delay on taking action to avert dangerous climate change. If we take action and make real changes to lower our greenhouse gas emissions these changes in our lifestyle will also benefit our sustainable development. Our global community has ten years to halve our global greenhouse gas emissions. We need to make an urgent switch from fossil fuels to renewable energy and an immediate global priority must be to phase out our use of coal. We need to redouble our efforts to increase our level of ambition to lowering our greenhouse gas emissions in the next round of our national commitments which are due by 2020. We must decarbonise the electricity sector by 2050 – goals that we in our Pacific islands are already committed to and are on the journey towards achieving. This report provides us further science to support our calls for action on the global stage. We ourselves are also making sure we take action at the national and Pacific regional level with actions to reduce our greenhouse gas emissions. We are displaying global leadership for all humankind. As we head towards the UN Climate Change Conference at the end of the year, our Pacific island nations remain steadfast on this journey towards lowering our global warming to 1.5 degrees Celsius. Science tells us that we can reach the 1.5 global warming target. What we are experiencing in our Pacific island lives tell us that we must. We must persevere. We must commit to action and change. It’s “hashtag doable” as this current tech generation would say. It’s in our hands, as a global family to do right.